What a picturesque place. Can you believe that it is directly under the carriageway of the Erskine Bridge? With the summer holidays round the corner, the shackles of cubs, choir and other after school activities are being gradually loosened and I am starting to breathe a little easier. One day last week I had no commitments to get the kids to and the sun was shining. We decided to have a bicycle adventure; a magical mystery tour. Our bike adventures involve turning up at the station and getting the first train that appears. A number snatched out of the air by one of the children defines the stop we get off at. We are fortunate that our local station is Hyndland, which receives trains to such delights as Balloch, Milngavie, Helensburgh, stops along the Forth and Clyde canal, Chatelhereux and along the clyde valley. Almost every train has a plethora of adventures begging to be had and so I was delighted when the first train that stopped was for Balloch. Loch Lomond was calling. But my daughter insisted on playing by the rules and we found ourselves alighting in Dalmuir surrounded by high rise blocks of flats and unkempt public spaces. This is when the app ‘Cycle Hub’ comes into its own. 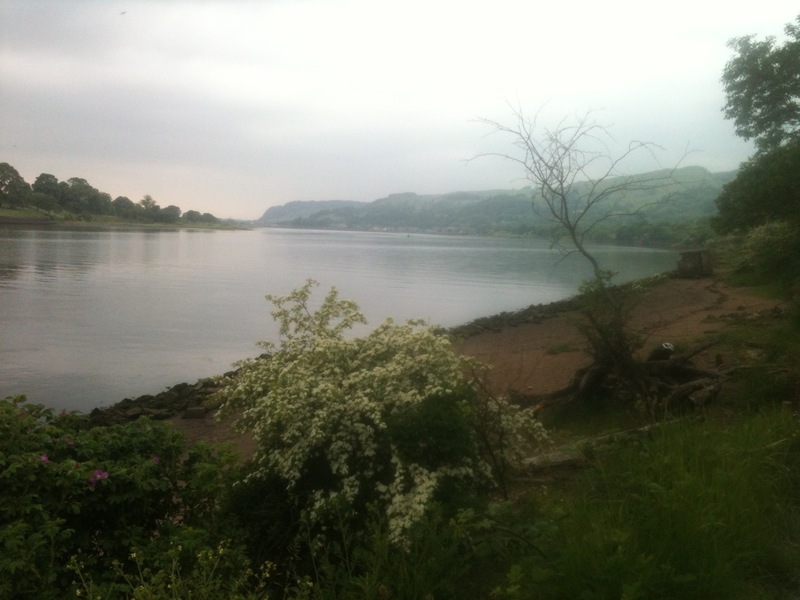 It showed an off route cycle ride all the way along the canal to Bowling and onwards on a disused railway and along the river Leven towards Loch Lomond. We set off passing a couple of small groups of men huddled at the side of the canal with cans of special brew, and some pasty- looking youth with fishing rods. But soon the people thinned out and we’d passed the last of the ferocious dogs accompanying their unpredictable-looking owners and were almost underneath the soaring carriageway of the Erskine bridge. A slight diversion off the main route took us to the Saltings Local Nature Reserve, and a lovely sandy beach directly under the bridge. Some concrete fortifications were subsiding into the river, nearly a kilometre wide at that point, and a wild rose climbed over the bank. We sat on a driftwood tree, stripped bare and bleached, and chewed on a croissant as a flock of common terns flew upstream. Nature has done a good job of recolonising this once- industrial landscape. Hordes of wildflowers filled the meadow we cycled through to get back onto the cycle path. I wasn’t expecting much from this adventure but West Dumbartonshire revealed some of its charms to me on the journey. A stop at Bowling to see the sea lock of the Cycle canal was enhanced immeasurably by meeting Jimmy and ‘Wee Spark’ his Clyde puffer. Jimmy explained how he had made the third-size model with a friend and that they had been the first boat to take a cargo from The Clyde to the Forth for (loads of) years and had followed the Queen’s boat over the Falkirk wheel at the official opening. A little further along we came to a bike workshop slotted into one of the arches of a viaduct and, opposite it, a bundle of freckled boys, bellies hanging over their swimming shorts, taking it in turns to hurl themselves from the handrail of the foot bridge into the canal. Head first, or belly first and, from time-to-time, a Tom Daly-esque back flip. The sea lock itself was fascinating. A vast weight of history, poignantly underlined by the hulks of rotting boats on the mud the seaward side of the lock. 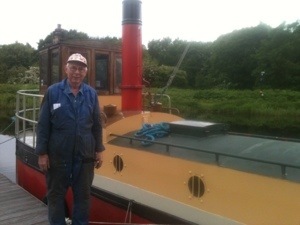 However on the canal side of the lock, colorful steamers and narrow boats and a few wooden yachts were moored. that the hoped-for salubrious canalside restaurant existed. The closest we got to an eatery was a single storey, prefab pub with peeling black paint and wire grills over the narrow windows. “But the sign says ‘serving family meals”’ said my daughter. ay separating us from the Clyde to see the view. And we discovered the most wonderful place. Past the remains of a couple of burnt out cars and two people sat at a fire drinking from bottles was a wonderful piece of habitat: saltmatsh to the west of us and reedbed to the east. Ahead mud flats. iew down the river towards Dumbarton Rock, the sentry of the Firth of Clyde. It was evidently a very special place for nature. I returned to the city as refreshed as if we had made it all the way to Loch Lomond, and the edge of the Highlands. Sometimes you find what you are looking for in the most surprising places. This entry was posted in Miscellaneous, Work and tagged Bowling, Canal tow-path, Cycling, The Saltings by nager. Bookmark the permalink.